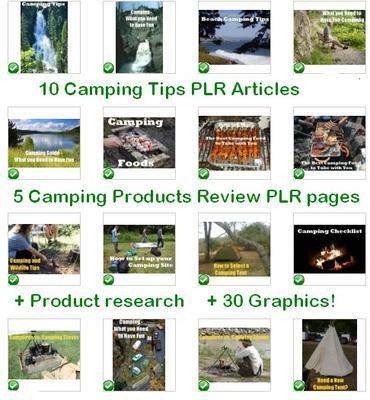 10x CAMPING and 5x Camping Product Reviews Articles Pack for a total of 15 pages of top niche content plus bonus graphics and it even has detailed niche research for top products to promote as an affiliate! In this pack there is a total of 15 pages of content starting first with TEN articles about camping tips, how to set up camp sites, foods to pack, camping checklists, and about the products to use when camping out. Then you get FIVE pages of content specifically reviewing the top camping products, to help Amazon affiliates get that “Cha-Ching!” click from readers! Another bonus is a niche research breakdown on the most popular products being sold in the camping niche with links to the products on Amazon and the product reviews! On top of all this camping content you also get some bonus graphics to use on your site, review pages and your social networking posts to drive that traffic to your site! Here are the best selling products on Amazon that can be promoted on your camping sites! It is a very good idea to create a camping checklist before each trip to the woods or lake. You don’t want to leave anything behind, especially the essential items needed to make your camping experience fun. Having a list will allow you to double check your gear and be sure everything has been packed. Without a checklist, it’s almost inevitable that you will forget something. If it’s an item that isn’t extremely necessary, such as a book or pillow, then you may be able to go on without it. However, if you were to forget something that is needed, such as matches, first aid kit, or sleeping bag, then you may be running into problems. You can divide the checklist into categories to help you make sure you have packed the items. It will also help you creating the list. Categories for bedding, cooking, shelter, and miscellaneous items are all recommended. 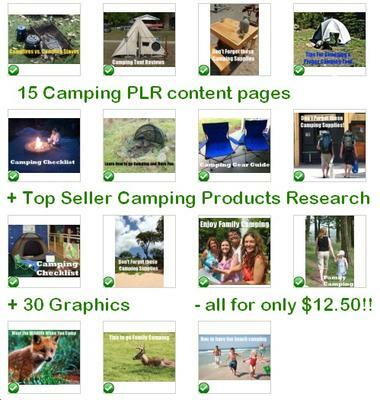 This *HUGE* PLR content pack is the whole enchilada, everything you need as an affiliate to set up a simple niche site or web 2 profile account to sell camping products and share camping tips for your readers!